Take your vacation to the next level at Universal Orlando Resort™. Three amazing theme parks, including an incredible water theme park, provide days of thrills and adventure beyond your imagination. Breathtaking on-site hotels put you right in the middle of it all and pamper you with an array of world-class amenities. Plus, Universal CityWalk’s dazzling variety of dining and entertainment options ensure that you can kick up the excitement or just kick back and relax from early in the morning until the wee hours of the evening. It’s days and nights of endless fun for every member of the family. Vacation beyond anything you’ve experienced before at Universal Orlando Resort™. Universal Studios Florida™ Immerse yourself in the next generation of blockbuster entertainment at Universal Studios™. You’ll script an incredible day of fun at this real, working film and TV studio that features rides, shows and attractions that put you right in the middle of the action. 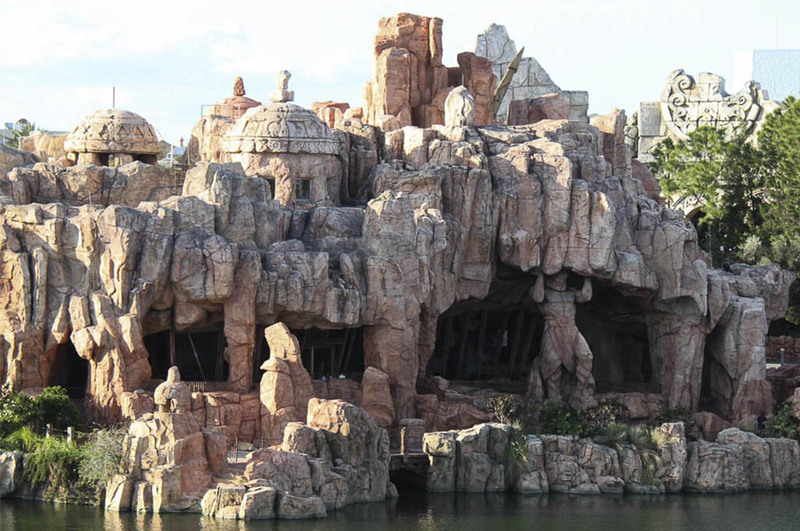 Universal’s Islands of Adventure™ Journey through the legendary worlds of incredible heroes at Islands of Adventure. Here you’ll step right into powerful stories, myths, and legends on rides and attractions that will excite all your senses. Universal’s Volcano Bay™ Enjoy the thrills and relaxation of a tropical paradise like no other. 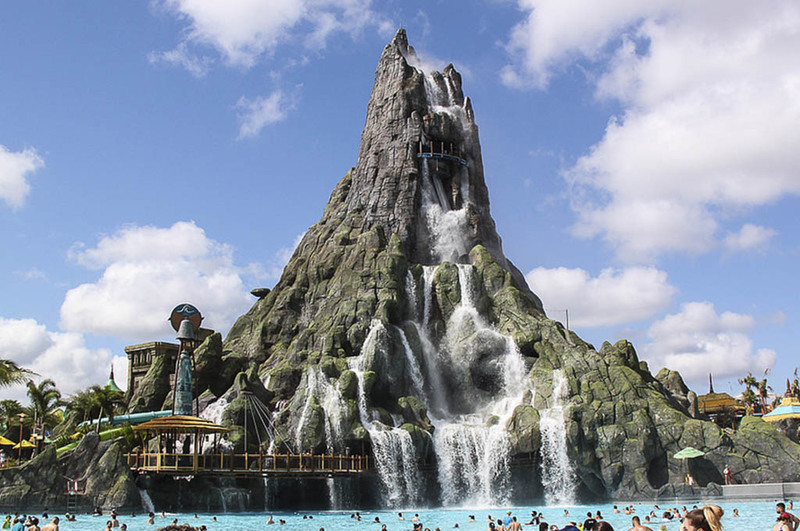 At Universal’s Volcano Bay™ water theme park, you’ll find an oasis of excitement along with laid-back luxuries creating an entirely new vacation experience. On-Site Hotels The ultimate Universal Orlando Resort™ vacation begins at one of their spectacular on-site hotels. There’s one for every vacation style and budget, with thoughtfully designed rooms and suites that welcome you to enjoy every moment of your stay. Universal CityWalk™ Savor the unforgettable dining and unparalleled entertainment of Universal CityWalk™, home to an array of themed restaurants, clubs, concert venues, movies, shops, miniature golf and more. Castles and Dreams Travel offers vacation packages through the official travel company of Universal Orlando Resort, which means you’ll have access to exclusive vacation packages and enhancements. From hotels to airfare to rental cars to theme park tickets, we have everything you need to design the ideal vacation in one simple, easy and convenient transaction. Universal Studios was the first theme park created in Universal Orlando Resort back in 1990 and it's formed by 8 themed areas. In Production Central, you'll find the famous roller coaster "Hollywood Rip Ride Rockit" only suitable for the bravest, and "Transformer's: The Ride" a 3D experience in which you'll have to save the planet from Megatron and his villainous Decepticons. This is the authentic paradise for Harry Potter's fans. Lose yourself in Diagon Alley and buy the perfect wand at Ollivander's. Visit King's Cross Station and board the Hogwarts Express to travel from Universal Studios to Islands of Adventure Theme Park where you can continue your journey through the wizarding world of Harry Potter. Don't miss the chance to experience "Harry Potter and The Escape from Gringotts" a multidimensional 3D thrill ride which is considered one of the best rides of the park. You'll have to escape the extreme security bank and, of course, evade Voldemort and Bellatrix Lestrange to get back safe to Diagon Alley. Looking for the perfect plan for the whole family? Join Gru, his daughters and the adorable minions in a fun 3D adventure or take a picture with SpongeBob and his friends. There is also an entire area with rides to the little ones: "Woody Woodpecker's Kid Zone", where you can get immersed in the E.T. Adventure or ride the Nuthouse Coaster. You cannot leave without visiting America's most famous family in "Springfield: Home of The Simpsons". After boarding The Simpsons Ride and Kang & Kodos Twirl 'n' Hurl, it's time for a walk through Springfield's Primary School, Moe's Tavern and Kwik-E-Mart. Universal Studios Orlando is the only theme park with recreations of these Springfield's famous locations and the only place where you can have a Duff beer. Universal's Islands of Adventure has been elected TripAdvisor Travelers' Choice as the best amusement park in the world from 2015 to 2017. Prepare for a place where superheroes, beasts and magical creatures stand before you. Are you ready for Marvel Super Heroe Island? The Incredible Hulk Coaster will catapult you out with the force of a fighter jet. Hulk-like power will propel you upside down into a weightless zero-gravity roll, racing faster and faster down the track. Not enough for you? Doctor Doom's Fearfall will blast you 185 feet into the sky and then, without a second to catch your breath, hurl you back down with a force stronger than gravity itself. Don't leave without visiting The Amazing Adventures of Spider-man, a high-flying virtual reality ride in which you might want to be aware of the 400-foot freefall. Don't miss Jurassic Park River Adventure, a scenic water cruise that starts innocently watching a baby stegosaurus and its mother share a moment. Then out of nowhere, you'll be bumped off an 85-foot drop into the restricted area of Jurassic Park, where suddenly a T. Rex will stand before you and you'll have to escape from his razor-sharp teeth. Traveling with kids? You'll find plenty of rides and activities for them in "Seuss Landing" and "Toon Lagoon". You will find the other half of the wizarding world of Harry Potter: Hogsmeade at Islands of Adventure. In this land, you'll find exciting rides like "Flight of the Hippogriff" and the amazing adventure "Harry Potter and the Forbidden Journey". Explore the classrooms and corridors of Hogwarts Castle and refresh with a cold butterbeer. Finish your day at the park watching the nighttime lights at Hogwarts Castle, a show that transforms the castle in a dazzling display of ligths, special effects and music. Welcome to a tropical oasis where thrills and relaxation flow in pure harmony. A new kind of paradise based on the conviction that water is life and life is joy. Opened in 2017, Volcano Bay is the third theme park of Universal Orlando Resort. This park has four areas of fun for all ages: The Volcano, Wave Village, River Village, and Rainforest Village. In The Volcano area, you'll find the most thrilling rides like Kala & Tai Nui slides, where twin trap doors plunge two guests down clear, intertwining tubes before sending them into the turquoise waters below, and Punga Racers, 4 slides with different exciting twists. Krakatau Aqua Coaster will let you experience the volcano power on a four-person canoe that slides upward through the mists and into the dark twists and turns within the volcano before emerging through a waterfall. And last but not least, Ko’okiri Body Plunge will drive you crazy with a 70-degree dizzying fall from 125 feet high. Moving on to the next area, Wave Village will bring you a relaxing experience at Waturi Beach, an ideal place to chill on a sunbed or enjoy the wave pool. River Village offers you a ride through Kopiko Wai winding river and 2 great play areas for kids: Runamukka Reef and Tok Tiki Reef. Besides, here you'll find Honu, where you can surf the underwater currents on a four-passenger raft, speeding through an open flume and streak along two massive walls emblazoned with Waturi turtles. Finally, you cannot miss Rainforest Village. Role in a serpentine adventure at Ohyah & Ohno drop slides that will end 6 feet above the pool and take a ride on Maku Puihi, a multi-person rafting ride that will get your heart pumping. City Walk is located outside the entrances of Universal Studios and Island of Adventure. It's an entertainment area with plenty of shops, restaurants, theaters, and clubs. Here, you'll find many clothing stores, including a Fossil flagship. There's also a Universal Studios Store where you can get their branded products, plus movies, TV, and characters merchandise. City Walk is the perfect place to eat with many restaurants with food from all over the world. It offers everything from snacks to elegant gourmet cuisine. Have some Mexican food at Antojitos, the best hot dog creations at Hot Dog Hall of Fame, or grab a burger and a side order of rock history at world's largest Hard Rock Café. You'll find any kind of food you're looking for: sushi, burgers, burritos, pasta, pizza, grilled meat, seafood, sandwiches or ice-creams among many other options. Are you a chocolate lover? The Toothsome Chocolate Emporium will offer you a culinary alchemy with gourmet chocolates and one-of-a-kind desserts. Don't miss the opportunity to watch the "Blue Man Group" show, a combination of music, comedy and multimedia theatrics. Continue the fun at AMC Universal Cineplex and its 20 screens with stadium seating or prove your golf skills at Hollywood Drive-In Golf, 36 holes of mini-golf in two fun courses modeled after 50s-era sci-fi and horror. Did the sun go down? It's time to have a cocktail and go dancing in the clubs. Do you feel like singing tonight? No problem with that, let your audience enjoy your karaoke performance at the Rising Star. The best way to experience all Universal Orlando™ has to offer with this epic 3-Park vacation package starting from only $99* per adult, per night, tax inclusive. Plus, save up to $100** with select travel. Now you can customize your Universal Orlando Resort™ vacation package and compare hotels, theme park tickets, transportation options, flights and more. Universal Orlando's Best Price Guarantee§ means you'll enjoy the best package selection and value based on your travel dates and party size. And whatever options you choose, you'll get special benefits like Early Park Admission◊ one hour before the theme parks open (valid theme park admission required). Only Universal Orlando’s hotel guests get more ride time, more free time and more family time every day of their vacation. It couldn’t be easier. Every morning guests can breeze into one of Universal’s Parks before other guests*. Free water taxis and shuttles mean it’s always a quick hop between the parks and their hotel. Each of Universal’s amazing hotels are conveniently located just across from one of Universal’s theme parks—so guests stay right on the corner of everything. This is the modern and stylish place to stay. This new landmark offers views of all three Universal Orlando™ theme parks and embodies a design that is vibrant, free-flowing and calming. The vibrant and sunny styling of Universal’s Endless Summer Resort - Surfside Inn and Suites & Dockside Inn and Suites, brings a simple, free-spirited vibe to your Universal vacation. Surfside Inn and Suites will open in Summer 2019. A sister hotel, Dockside Inn and Suites, will open in 2020. Both hotels will be part of Universal’s Endless Summer Resort. 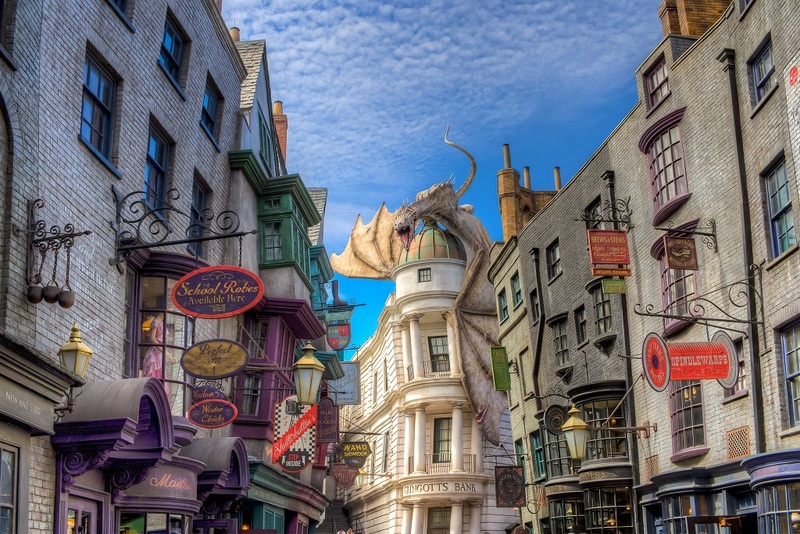 Ready to book your Universal Orlando vacation package? *All prices, package inclusions & options are subject to availability and to change without notice and additional restrictions may apply. Errors will be corrected where discovered, and Universal Orlando and Universal Parks & Resorts Vacations reserve the right to revoke any stated offer and to correct any errors, inaccuracies or omissions, whether such error is on this website or any print or other advertisement relating to these products and services. *Rate is per adult, per night, tax inclusive and based on double adult occupancy on a 5-Night stay at the Rosen Inn International, Standard Room. Subject to availability, room type, hotel, and travel dates selected. Rate valid for bookings now – 11/30/18 and travel Sunday - Thursday; 6/30/18 -10/4/18, 10/7/18-10/11/18, 10/14/18-10/18/18, 10/21/18-10/25/18, 10/28/18-12/20/18, 1/1/19 – 4/14/19, 4/24/19 – 10/3/19, 10/9/19 – 10/10/19, 10/13/19 – 10/17/19, 10/20/19 – 10/24/19, 10/27/19 – 12/20/19. 4 Night Minimum Required. Reservation must be made 72 hours in advance. Additional hotels, rates and travel dates available. 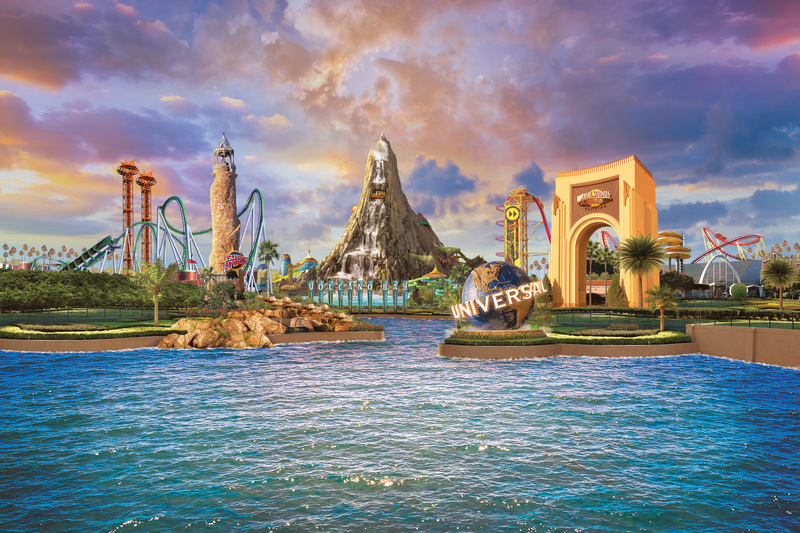 §Savings based on the travel dates of the Splash, Stay and Play vacation package from Universal Parks & Resorts Vacations™. Offer valid on new bookings only. Valid for bookings now – 12/12/18 with travel now – 12/31/19. One offer per package, not valid with other discounts, promotions or prior purchases. Cannot be combined with other offers. Void where prohibited. Additional restrictions may apply and subject to change without notice. ^Tickets are nonrefundable, non-transferable, and must be used by the same person on all days. Valid only during normal operating hours. Parks, attractions, or entertainment may: close due to refurbishing, capacity, weather or special events; change operating hours; and otherwise change or be discontinued without notice and without liability to the owners of Universal Orlando Resort (“Universal”). Tickets exclude admission to separately ticketed events at any of the Universal theme parks or within any of the CityWalk™ venues. Some CityWalk venues require ages 21 or older for admission. Valid Photo ID required. Unless otherwise stated, does not include admission to AMC® Universal Cineplex 20 with IMAX®, the Blue Man Group show, or Hollywood Drive-In Golf™, and parking or discounts on food or merchandise. Additional restrictions may apply and benefits are subject to change without notice. ◊Requires theme park admission. Early Park Admission begins one (1) hour prior to regular scheduled park opening to either Universal Studios Florida™ or Universal’s Islands of Adventure™ as determined by Universal Orlando and Universal’s Volcano Bay™. Valid at select attractions at each park. Attractions are subject to substitutions without notice. Additional restrictions may apply. Universal Parks & Resorts Vacations is registered with the State of Florida as a seller of travel. Registration number ST-24215. Universal elements and all related indicia TM & © 2018 Universal Studios. All rights reserved.